The Disector is used to count objects in three dimensions. The Disector uses the counting frame and extends the set of counting rules described on the Counting Rules page to count objects in two adjacent sections. In fact, the term Disector comes from the composition of the terms di for two and section. The two sections must be close enough so that it is possible to infer what lies between the two sections. This makes it possible to use the Disector to sample volume. The two sections are referred to by unique terms. One is called the reference section and the other is called the lookup section. Particles are selected in the reference section and counting is done in the lookup section. If a particle appears in the reference section but not the lookup section, then the particle is counted. This ensures that a unique point, i.e., the top, of the particle is counted. Figure 1. An example of the Disector. The black arrows in figure 1 point to the location of a cell in two adjacent sections. The top image is the lookup section, where the cell is not distinguishable. 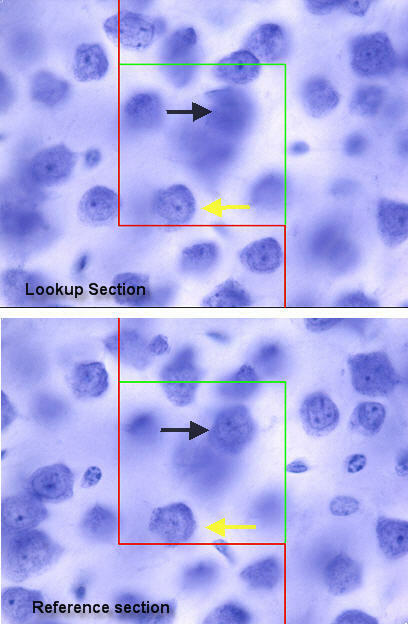 In the bottom image, the reference section, the cell is in clear focus. Thus, the cell would be counted. The yellow arrows point to another cell in the same adjacent sections. This cell clearly seen in both sections and would thus not be counted. The Disector is also referred to as the Physical Disector, especially in literature that follows the introduction of the Optical Disector. Sterio DC., J Microsc 1984;134;127.